Velvety, rich dark chocolate combined with salty peanut butter...and inside, surprise goodies of your own, personal choosing. What's better than that? But first, a lesson. It's a simple one. Don't set utensils by the burner! Easy enough, I know, but sometimes a reminder is necessary. This was mine. Out of the corner of my eye a tiny, dancing, red flame. Wait, a flame?! ... and smoke...oh dear. It was caught soon enough, however, and put out by me frantically waving the spatula about as if I were Ron Weasley trying to cast a spell, with my burning spatula broken wand. A sharp, "eeek!" And, "No sweetie, nothing's wrong. Don't come in here!" And then it was all over. I am always putting things in "precarious" positions, as Todd would say. It's his most fervent pet peeve. He has this look, it's a "You have placed that (insert any random household item) in a very precarious position, Katie" sort of look. Think a dinner plate, delicately balancing on a sofa arm. A cup brimming with hot tea, teetering on the edge of the table. Gleaming knives, blade up in the drying rack. A bubbling pot on the stove, handle sticking out, ready to clothesline it's unassuming victim. You get the idea. It's part of my charm though, I am sure of it. Back to this look he has though, it is a very impressive and effective look...as far as looks go. Was my bamboo spatula worth it all? For these Unique Dark Chocolate Peanut Butter Cups, absolutely. They are really very simple and quick, too, provided you aren't having to put out (and cover up) any small kitchen fires. I love how adaptable these little cups of heaven are to each person's unique taste. Don't like dark chocolate? Use milk chocolate. Not a molasses fan (I love it's earthy profile)? Use honey or agave nectar, instead. Almond butter more your thing? Go for it, or use hazelnut, macadamia or cashew butter for that matter. The Kahula can be replaced with pretty much any extract or liqueur, and as for the add-ins, put in anything that makes you tickled pink! I used matcha powder and loose-leaf chai tea. Crystallized ginger, finely chopped nuts, cocoa nibs, smoked chipotle chili powder, jam, lavender or even wasabi would be delightful! - A Note: This recipe makes about seven thinner cups (see image). The recipe can be doubled if a more robust cup is warranted. I think you'll find, however, these are so dark and scrumptious, that a thinner cup is all that is needed to satisfy! Break up the chocolate in a small stovetop approved bowl. Place bowl over a small saucepan with just enough water so it doesn't quite touch the bottom of the bowl. Bring water below to a boil, then turn low so as to just keep a slight boil. Whisk chocolate intermittently to get rid of any clumps and to ensure the chocolate doesn't burn. 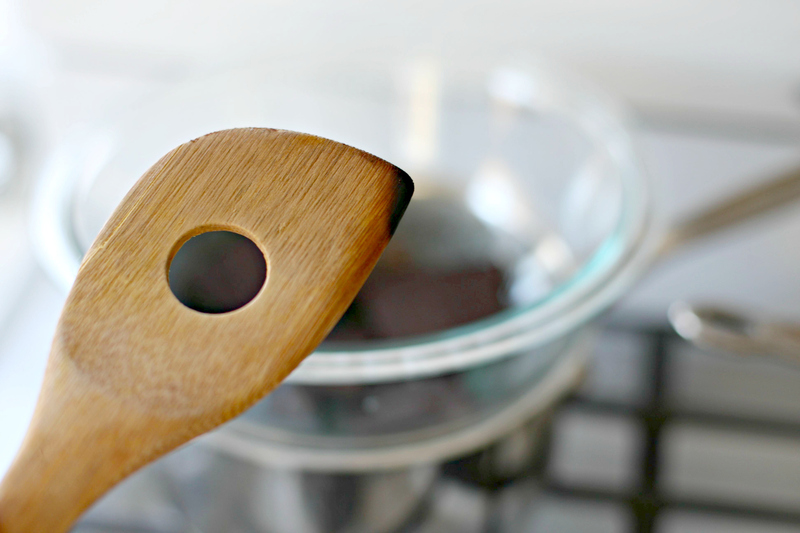 While chocolate is melting, mix together remaining ingredients in a small bowl except for any add-ins you wish to use. Stir with a spoon so everything is well combined and then continue for at least a few more minutes until the mix reaches a tacky consistency that can be formed into a small ball. 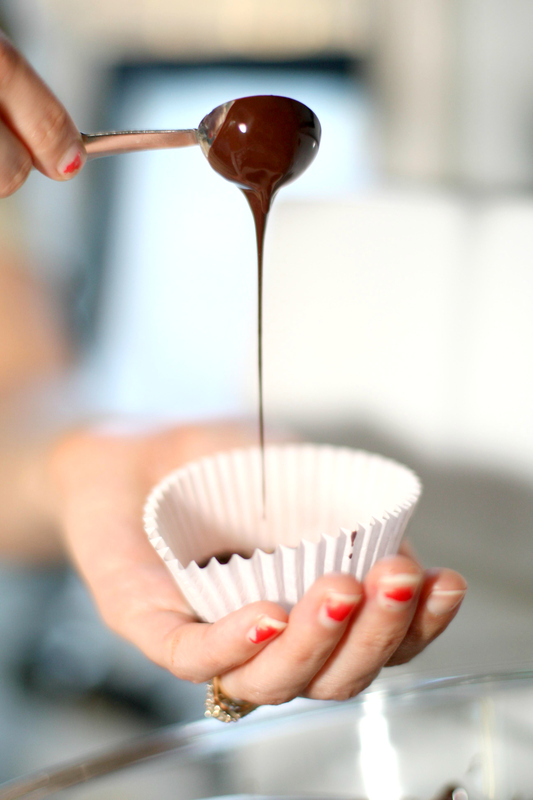 When the chocolate is melted and smooth, place a teaspoonful into base of cupcake liner. Tilt the liner around until the chocolate is covering the entire bottom. Next, form about a one and a half teaspoons of peanut butter mixture into a small ball and flatten slightly with fingers. Place in bottom of liner on top of chocolate, and cover with about one teaspoon more of chocolate. Sprinkle salt on top. Continue with remaining cups. If using any add-ins, sprinkle them on top of the peanut butter ball in the liner and then when covered with chocolate, sprinkle more on top. That way you'll know which ones are which! Place on a plate and cover with cling wrap. Refrigerate for at least thirty minutes. Keep stored in fridge and take pride in the fact that you never have buy those vastly inferior storebought cups again. Sit back, bite in, and revel in your snootiness.